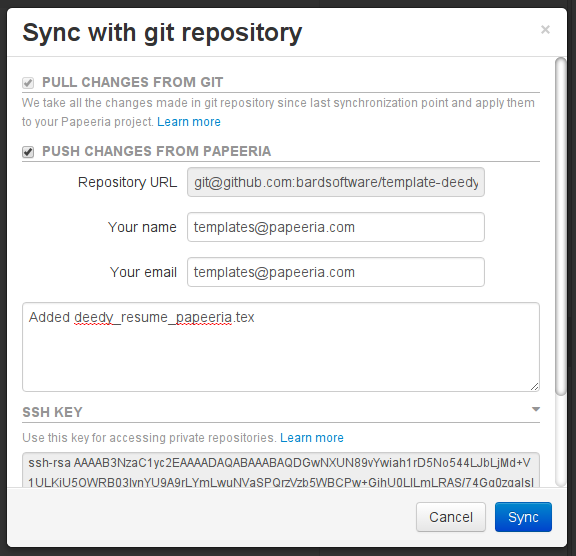 We're enhancing our Git integration which was first announced in April and allowed for importing Git repository when creating a new Papeeria project. Today we're launching new synchronization features which enable rich git workflow: pull, checkout, branch, merge and push. 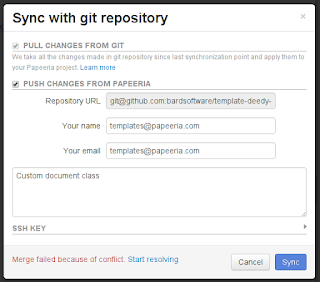 Git sync is available to both free and paying users, except that some restrictions apply to free users. I created a new project from our clone of Deedy resume hosted on GitHub and Git section in the Version Control pane shows me some information. 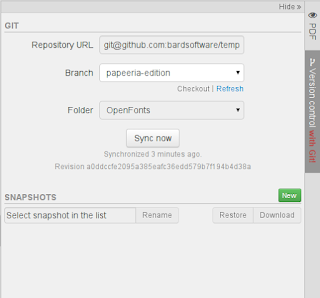 You can see repository URL, name of the branch and the last revision I synced with. I added a new empty file and now I am going to submit it to the repository. 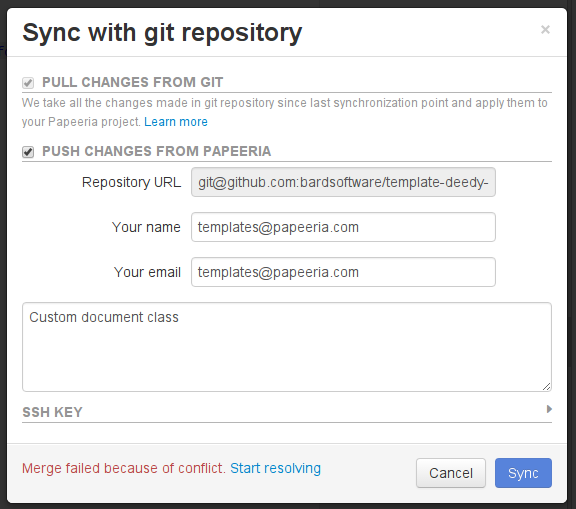 Clicking Sync now button in the Version Control pane opens Git Sync dialog where I can pull the changes from repository and optionally push my changes. However, I need to setup my credentials to be able to push. GitHub uses SSH public key for authorization, so I copy my public key from SSH key section in the dialog and paste it into my account on GitHub. Now I can push, and it completes successfully. I added a few more lines and at the same time my colleague who prefers to work offline cloned the repository on his laptop, changed some lines in his favorite TeX editor, committed the changes and pushed to the repository. 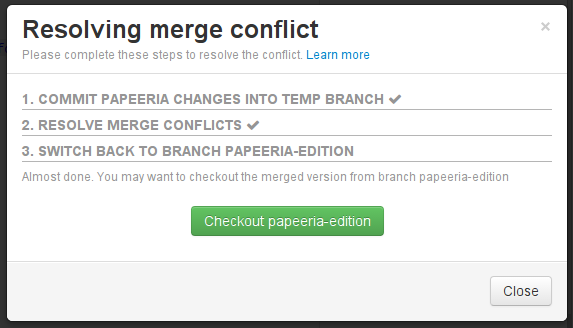 We're both using the same branch and I have to pull his changes into Papeeria and merge them with my work. I open Git Sync dialog, pull the changes and merge completes fine as we didn't touch the same lines. However, when it comes to merging we're not always that lucky. Now we both have changes the same line and my attempt to sync failed with merge conflict. 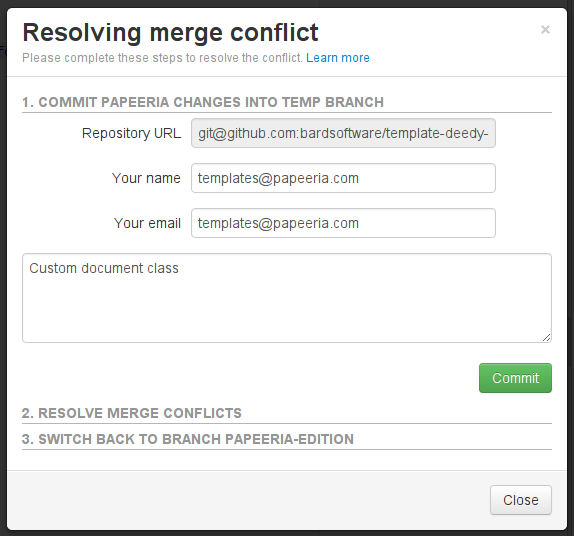 Project in Papeeria remains intact when merge fails so if I was not in the mood to resolve the conflict I would've just continued my work and merged later. But I don't mind resolving the conflict so I click Start resolving. 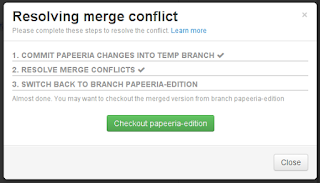 Papeeria suggests committing my work into a temporary branch -- that's cool because it allows me to commit and push my updates immediately without waiting for merge. Now I need to do the merge and I realize it requires running an external git client. I decide to enjoy a cup of coffee before digging into the command line and I close the dialog. Papeeria shows me a reminder about the ongoing merge in the Version Control pane. In a dozen of minutes I get back to Papeeria and click Resume resolving. Merge dialog shows me a few commands which I have to run. 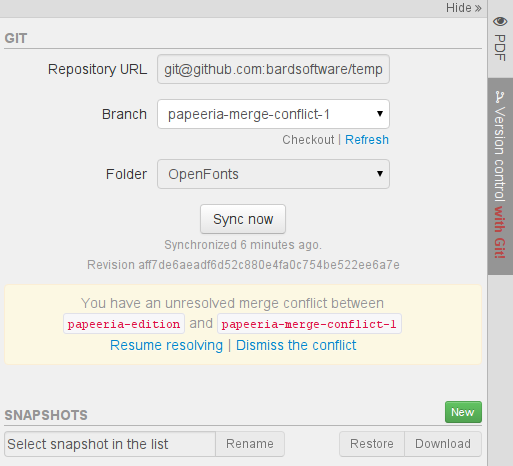 git clone, checkout, merge, edit the conflicts in the text editor, git add, commit, push... done! I've merged the changes and pushed them back to papeeria-edition branch which I had been synced with before the conflict happened. I proceed to the third step and switch to papeeria-edition branch again. Only newly created project can be git-enabled. Users subscribed to free Epsilon pricing plan can only pull and push to public repositories hosted on GitHub, Bitbucket, GitLab and Assembla. 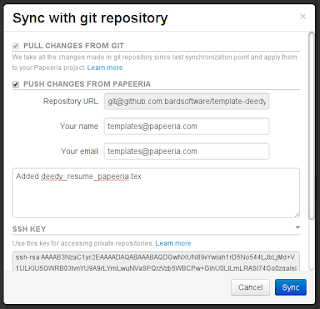 If you plan to push from Papeeria to Git repo, use SSH protocol and authorize your public key. 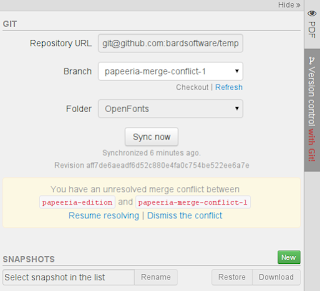 Merging in case of conflicts requires using external git tools. Have fun with Git and do no hesitate to contact us in case of any troubles!